It is time for another review and this time I have for you Township published and created by Playrix Games. And I want to tell you that this is a game that everybody who loves tycoons should try it! Once a game genre blows up on Facebook, it gets increasingly more difficult for new developers to find a way to make their entry in the genre feel distinct. Playrix’s Township, rather remarkably, manages not to look or feel excessively like any of the other city building games currently available on Facebook. What sets Township apart is a mechanic that ties the size and prosperity of a user’s town to economic factors like farming, industry, and trade. While the result may levy a “no friends” tax on solo gamers, it has lots of promise for players who have friends in the game with them. You start a game of Township with a relatively well-settled starter town and plowed plots of land where you can grow crops. You begin with wheat but can eventually grow other staples like cotton and sugar cane. You get 10 plots at the game’s beginning and have to unlock more by growing your town’s population. This involves managing the happiness level of your citizens, which determines how many people can live in your town. 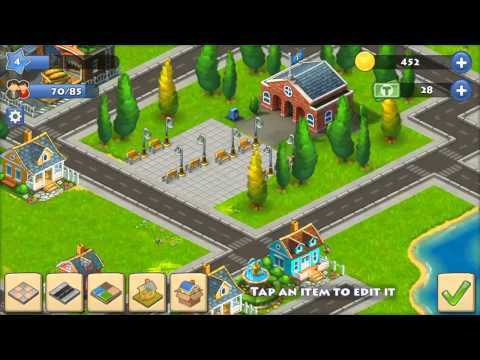 You make citizens happy by building decorations and certain types of buildings. Once they’re happy enough, you can increase your population by building houses. And now let`s continue with the gameplay review and see what is this game about. I mean you are a mayor but I want to see what lies ahead. You can simply sell the crops you grow in Township, as in many other games, or you can invest resources in processing them. For instance, if you grow wheat you can opt to use your mill to grind it into flour and then ship the flour off to your bakery to become bread. You get much higher profits for selling 10 loaves of bread than you would for simply selling 10 units of wheat. This, in turn, helps you afford more decorations and lets you level your town up faster. You can build additional types of factories over time, which usually requires expanding your town due to their sheer size. As I said, this is a nice game but it is not my type!